With the first few weeks of fall upon us, the air is getting crisper and leaves are changing colors. Warmer weather is replaced with cooler temperatures, and many are wondering when the first frost can be expected in their region. The average date of the first frost for each major climate site in the Northeast, as well as the earliest and latest occurrences. Across much of the Northeast, the first frost typically occurs sometime in October. At this time last year, only two major climate sites in the region had experienced their first frost, with many other locations dipping below 32˚F later in October or November. 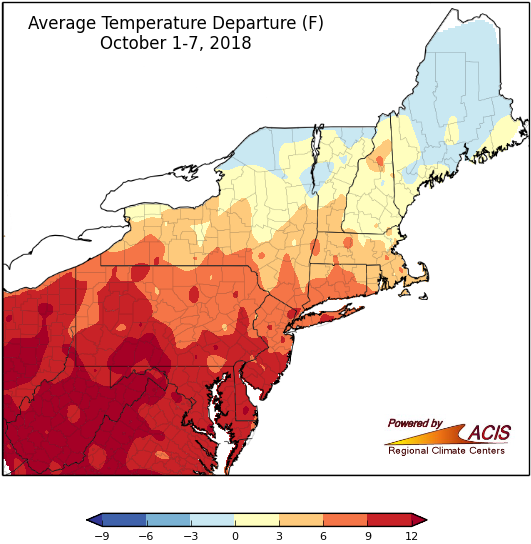 After a warmer-than-normal September for the entire Northeast, so far only one of the 35 major climate sites in the region has experienced their first frost (as of October 7). Dropping well below freezing on September 24, Caribou, ME registered a record low temperature of 26˚F that day. Temperatures this month have largely been above normal, except for parts of northern New York and New England. First frosts can be highly variable in the Northeast. The earliest frost of the season at any of the major climate sites in the Northeast occurred on August 29, 1986 in Concord, NH, which was almost a month earlier than normal. LaGuardia Airport, NY recorded the latest first frost in the region on January 4, 2016, after a warmer-than-normal fall. For more information about any frost/freeze warnings in your area, visit the website of your local National Weather Service office.